When Fidelity Go first launched, it was no match for Betterment. But as time has gone by, Fidelity has made its robo-advisor more attractive to investors by lowering its investment minimum and distinguishing portfolio oversight by sticking with humans as opposed to computers. But do those differences give Fidelity the edge? In this review, we compare Betterment vs Fidelity Go across a range of key factors, like fees, account minimums, tax strategy, customer support, investment strategy, and account selection. As you will see, the two robo-advisors compete so aggressively on fees that the real winners are clients. But the neck-and-neck race on expenses is just one important consideration. To find out who comes out on top overall, read on! Which Robo-Advisor Is Best: Fidelity Go or Betterment? Betterment is a five-star robo-advisor but it’s not without rivals. Personal Capital, Wealthfront, and Ellevest all offer still competition on cost and services. The question is does Fidelity Go stand toe to toe with it? 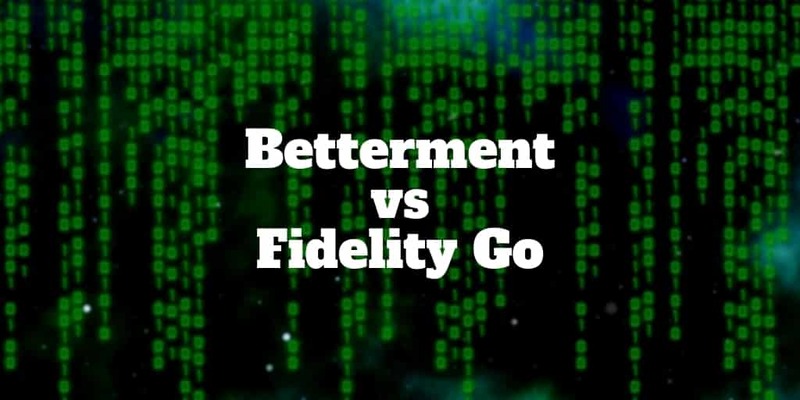 We’ll get to the Fidelity Go vs Betterment comparison in just a moment. But first, let’s see how Betterment stands out. Betterment Digital – a pure robo-advisor solution that manages money using computer algorithms. Betterment Premium – includes all the features of the Digital service as well as unlimited access to human advice. Betterment features behavioral finance methods to support goal-setting and help clients make more rational decisions. To ensure clients are fully invested, fractional shares are incorporated into both plans. Beyond standard portfolio management services, clients can make charitable donations via the platform easily and automatically. And they can invest in social-driven causes to align their investments with their values. There’s lots more too, but first let’s get a glimpse of what Fidelity Go has to offer. Like most robo-advisors, Fidelity offers automated investment management using computer algorithms. But it also offers a few twists on the usual robo-advisor offerings. Unlike most robo-advisors who compete on management fees but make little mention of expense ratio charges paid by clients at the fund level, Fidelity Go fees are more transparent. It bundles management fees and expense ratios into one overall fee, which is low when compared to others. It also separates itself from the pack by using human advisors to oversee investment decisions on customer accounts. Clients who may be hesitant to hand over full authority to a computer to manage their money may find this human aspect appealing. Nevertheless, a glaring gap in the Fidelity robo-advisor service is the absence of a tax strategy. As we’ll see, Betterment shines brightest in this category. The tricky thing about comparing robo-advisor fees is that management fees alone don’t cover the full gamut of costs you pay. A quick glance at Betterment vs Fidelity fees could lead you to conclude that Betterment is much cheaper. But upon closer examination, the two robo-advisors charge virtually the same amounts. Betterment Digital management fees are 0.25% which looks a whole lot less than the 0.35% charged by Fidelity for retirement accounts and 0.40% for taxable accounts. But Fidelity Go’s fees include management fees and expense ratio costs. On the other hand, Betterment – like most robo-advisors – passes on the costs of expense ratios to clients. The sum of Betterment Digital management fees plus the average expense ratio of 0.13% annually comes to a total cost of 0.38%. Betterment Premium clients pay an extra 0.15% annually for a total cost of 0.53%. Investormint Verdict: Fidelity Go receives a 10 out of 10 score for fee transparency and overall costs, though total average costs for Betterment Digital are only slightly higher. Like other top robo advisors, the entry-level Digital service has no investment minimum. However, Premium clients need to commit $100,000 to gain access to the higher tier of service. Originally, a $5,000 minimum was required to get started with Fidelity Go but nowadays that threshold has reduced to just $10. Investormint Verdict: It’s a virtual dead-heat but Betterment just edges out Fidelity. To keep more money in your pocket, Betterment applies a daily tax strategy in standard accounts called tax loss harvesting. The idea is to lower taxes on gains by selling losing positions to offset winning positions, and then to replace those losers with similar holdings that keep the underlying portfolio diversified. To optimize for taxes across taxable and retirement accounts, tax-coordinated portfolios are used to place tax-efficient funds in taxable accounts and tax-inefficient funds in tax-advantaged retirement accounts. Betterment claims that performance returns can increase by as much as 2.66% thanks to these tax strategies. Fidelity loses lots of points in this category. It doesn’t offer tax-loss harvesting, tax-coordinated portfolios, or tax minimization strategies – a rarity among robo-advisors. Investormint Verdict: When it comes to tax implications across taxable and retirement accounts, Betterment is leaps and bounds ahead of Fidelity Go. Investormint Verdict: Neither robo-advisor will manage your 401(k) automatically but Betterment will advise on it. If you are looking for an automated solution, blooom is best. Otherwise it’s a close tie with Betterment capturing the win. Both robo-advisors aim to spread risk and build diversified portfolios that match client risk profiles and financial goals, but they do so in very different ways. Fidelity uses its own funds primarily while Betterment relies on Vanguard funds. Fidelity Go client portfolios are mostly built using Fidelity Flex index funds that are divided across up to ten funds. Betterment spreads money across up to 12 asset classes, primarily using low cost Vanguard ETFs. Free rebalancing is included as part of both service offerings. The difference is it’s automatic at Betterment but manual at Fidelity Go. Investormint Verdict: We give the edge to Betterment because portfolio rebalancing is monitored more regularly using computer algorithms than at Fidelity which relies on human oversight. ✅ Fee Transparency: It’s refreshing to find a robo-advisor who includes management fees and expense ratios in one single fee quote. ✅ Hands-Off Management: Clients who want to place their investments on auto-pilot without worrying that a human will err in managing their account will fare best at Betterment. ✅ Human Oversight: Investors who are hesitant to trust computer algorithms to manage their money may find it comforting to know humans monitor their accounts. ✅ Tax Strategy: Fidelity has no tax strategy so Betterment wins this category hands down with tax-loss harvesting and tax coordinated strategies. ✅ Manual Rebalancing: Portfolio rebalancing is applied by humans, which may be a pro or a con depending on which side of the fence you sit. ✅ Account Selection: In addition to the taxable and IRA accounts Fidelity offers, Betterment also offers trust accounts. ✅ Investment Minimum: This is really a tie but Fidelity deserves praise for lowering its investment minimum to rival other robo-advisors. ✅ Tools & Services: Retirement tools, charitable giving services, socially responsible portfolios, and more are all offered free to Betterment clients. When we compare Betterment vs Fidelity Go on costs and investment minimums, it is hard to separate the two robo-advisors. A closer examination highlights that Betterment is the clear winner. It offers a comprehensive tax strategy that has the potential to boost after-tax gains. And a wealth of tools and services are included free. Beyond portfolio rebalancing, which Fidelity supports – albeit manually – Betterment also includes retirement tools and calculators, socially responsible portfolios, and automated charitable giving. It also offers a wider variety of account types and a larger group of asset classes. The bottom line is unless you are an existing Fidelity client or prefer manual oversight, Betterment comes out on top.